The skills of teamwork and how to create a collaborative, cohesive team culture can be learned and put into action. This assessment combines the self-knowledge you obtain through Everything DiSC with the transformative model that Patrick Lencioni introduced in his best-selling book, The Five Dysfunctions of a Team. This assessment provides a model and vocabulary to use with your team(s) to discuss areas of dysfunction or cohesion, a self-analysis that begins the discussion with honest disclosure, and a clear and challenging model for implementation. Respondents answer survey questions in three sections. The first is a set of questions used to determine one’s DiSC profile. 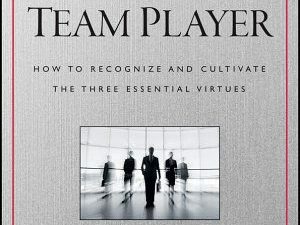 The following sections evaluate how frequently the team engages in the five behaviors and the team’s culture. The assessment is taken and administered online. A video will be viewed by participants when they get the link to the assessment. When you purchase any QuickStart package, we will set you up with an EPIC administration account from which you will email participants access codes to a survey and be able to track who has completed it and who needs another reminder. The assessment takes about 20 minutes. You can decide if the respondents get their report upon completion of the survey or if you want to provide printouts later in a training session. The 36-page report explains the model, provides an overview of the respondent’s DiSC style, and poses a number of items for team discussion. Discussion items are based upon the scores of the individuals and the team as a whole. 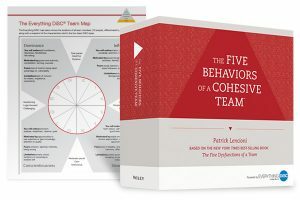 The model of cohesive team behavior is explained in the introductory pages. Then each of the five behaviors — Trust, Conflict, Commitment, Accountability, and Results — are covered. Each of these sections feature a definition, the team’s results, the impact your DiSC style and those of your team members can have on this behavior, additional learning tools or team insights, discussion items, and an action plan. The report ends with a summary of your team’s strengths and its challenges, with additional discussion questions. People do not need to have read The Five Dysfunctions of a Team or know their DiSC style before they go through this training. Both, however, are helpful. This assessment works best if there is a commitment to team building from your senior leadership. The information you gather here isn’t something you can cover in a two-hour training and be done. We recommend that you tailor your training to meet the needs of your team. That might mean half-day training sessions held monthly over five months. To be most effective, you’ll want to revisit this model and the action plans again and again. The process of building trust and mastering conflict can be emotional. People sometimes cry, get angry, or withdraw. Facilitators need to be comfortable handling such situations. Teams should be relatively small, from three to twelve people, to gain the most from this assessment and program. Teams should already be meeting regularly and have a shared purpose, with individual responsibilities. Going through this assessment and training can transform your organization. You’ll certainly discover people becoming more engaged and committed. You might also discover a few who will not find alignment and need to be assisted out of the team. The Five Behaviors of a Cohesive Team is a trademark of John Wiley & Sons, Inc.
That is really nice that a team assessment can be taken online and would only take about twenty minutes. Maybe it would be a good idea to take a team assessment survey sometime soon at work. Then our office would be able to work together as a good team. Is these material in spanish? I’m sorry, but it is not. Thank you for your inquiry. We can pass along to Wiley that there is an interest in a Spanish language Five Behaviors.